I wonder if one of these tiny little 12" bell Edgware Street Eb tubas' frames could be made into a compensating F tuba that plays usably well in tune? Is anyone familiar with how well these little cuties play in tune as Eb instruments? ...so it would cost Jonathan $250 plus shipping from Louisville to pick it up, toss the valveset, and play with it as a prototype. They weren't configured just like this 2-20 student model Eb, but weren't that much different. 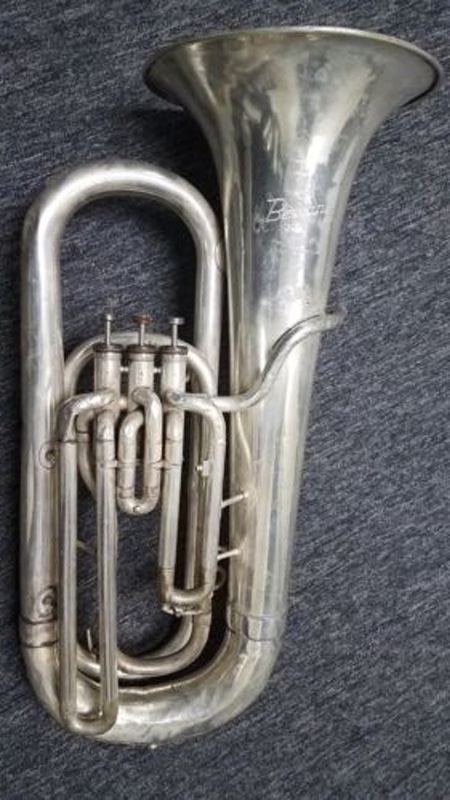 The Besson F like that one that I used as a student as UNT was one of the best F tuba sounds I have ever heard, and there were no useless notes like low C or whatever. However, the comp loops were cut very wrong and it could only be played in tune with much hard work and lot of fervent, on-your-knees prayer. It was so doggy in that regard. I used it to make a very respectable recording of Benvenuto Cellini with the top shelf school orchestra. I would own one had it had a scale that even vaguely resembled a Western one. If Jonathan could get an end product like that in tone and projection (it was LOUD) but with manageable pitch it would sell. We are actually working on a compensated F tuba based on a very good rare Besson F example from 1960's. That will be available in both 3+1 and 4 front piston configurations. The old Besson plays amazingly well with good intonation and surprisingly big tone - enough for me to want to brush up my F tuba playing. I am sure the new Wessex F will play equally well, if not better after Chuck Nickles has tweeked. I initially thought this would be easy to make using existing Eb parts, but has turned out to require all new bows and bell. I am hoping to have prototype by middle of this year. ...which is why I tend to wonder if a bell shaped more like that tiny 12" bell Eb bell might be better than that "fatty" Edgware F bell shape that was used. Heck...the Yamaha 621 F behaves itself pretty well, and that tuba is plenty loud as well...It seems as if it could be made into a comp, just as easily as anything. I suspect (??) 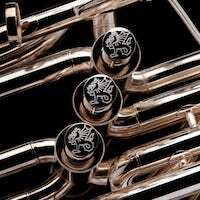 there are a bunch of euphonium players who would like to have a (very) small/accessible/usable F tuba that is configured in a way to which they are accustomed. The only one that I've ever had here was quite old and .689" bore...same as some very old Bohemian-made Alexander look-alikes.